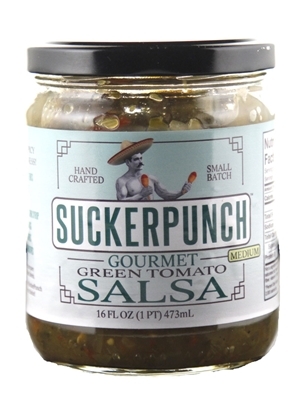 SuckerPunch went south of the border to look for inspiration in creating SuckerPunch Gourmet Green Tomato Salsa (Medium). It has all the bold flavor you would expect from a SuckerPunch Gourmet product while still being all natural without any additives or preservatives. This unique salsa will soon become your go-to party helper. All you need is a bag of chips and watch the compliments roll in. It also makes the perfect topper for your favorite grilled meat or a mix-in for rice and beans. Bueno! ​Green tomatoes, green pepper, onion, cider vinegar, sugar, red pepper, lime juice, cilantro.